Interest in space is on the rise in Toronto, and this weekend provided two great examples of this interest expanding out into the hearts of the general public, thanks to the University of Toronto Astronomy and Space Exploration Society (ASX), and the Toronto chapter of the Planetary Society. Part of the audience at the 11th Annual ASX Symposium on January 24th, 2014. Photo c/o ASX. Friday marked the 11th Annual ASX Symposium. Focused around the topic "into the cosmos," the complex and beautiful topic of cosmology was explored from the birth of our universe to all of its possible endings. Three talented and knowledgeable physicists: Dr. Anthony Aguirre, the associate professor of physics at the University of California in Santa Cruz; Dr. Matt Dobbs, an associate professor in the Department of Physics at McGill University; and Dr. Rafael Lopez-Mobilia, a senior lecturer & associate chair in the department of physics at the University of Texas at San Antonio were brought together for the sole purpose of spreading interest in astronomy. ASX organizers and speakers on stage at the 11th Annual ASX Symposium on January 24th, 2014. 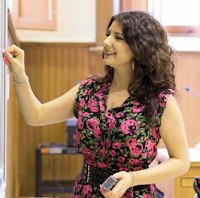 Author Sarah Ansarii-Manea is on the left. Photo c/o ASX. The audience was showered with information, and some even walked away with prizes. These included great books by Carl Sagan and Michio Kaku, plus a brand new telescope which was contributed by the Khan Scope Centre. The turnout was more than 200 people, with many old and new faces coming together to learn about all about what lies beyond our planet. ... educate the public on some aspects of cosmology, and encourage students and the public to get informed and involved in the exciting projects and discoveries in cosmology. In the past, the symposium has featured famous astronauts, numerous top researchers, and leaders in the space industry. 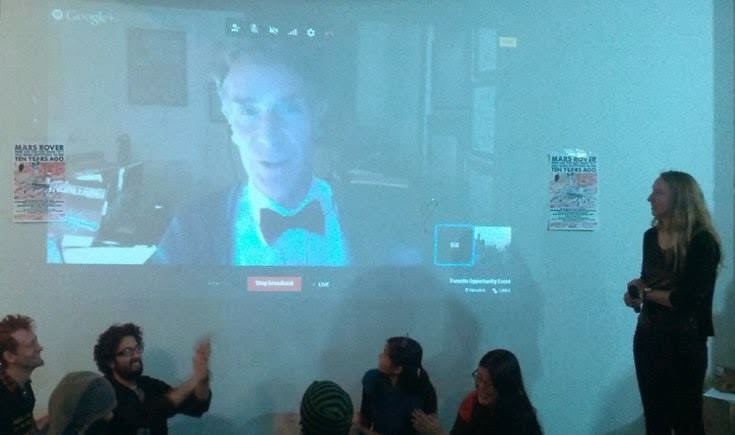 Planetary Society CEO Bill Nye, "the science guy" connects via skype with the "Opportunity Rover Ten Year Not Dead Yet Bash" in Toronto on January 25th, 2014. On the right is Kate Howells from the Canadian chapter of the Planetary Society. The following night had a more festive and celebratory vibe as Toronto came together to celebrate the NASA Opportunity Rovers tenth year of activity on Mars at the the Opportunity Rover Ten Year Not Dead Yet Bash. Contest winner "Bill Bot." Photo c/o author. As an engineering accomplishment originally meant to last only 90 days, Opportunity was certainly worth a party. Guests listened to great music mixed by a live DJ, drank “ Mars cocktails,” a fiery drink that sparked a lot of interest and even learned a little bit about "How the hell Opportunity has lasted 40x longer than its 90-day warranty." After mingling and dancing, there was even a competition to build the best cardboard and duct-taped robotic rovers. 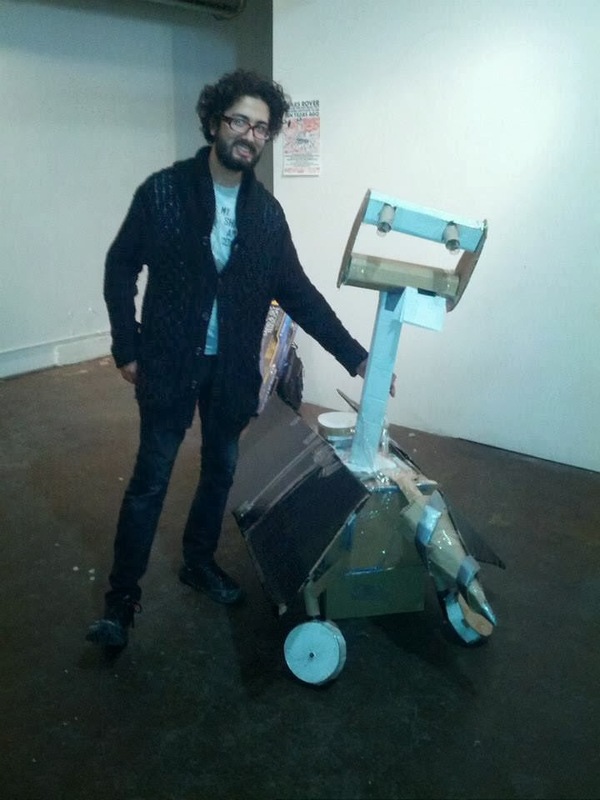 Participants, perhaps used to thinking outside the "cardboard box," ended up building rovers for both drilling and partying. The highlight of the night, was the judging for the best cardboard creations, which was performed remotely by none other than Planetary Society CEO Bill Nye. The winning group walked away with another telescope plus personal recognition from Nye, and it proved to be a great space party. It certainly wasn't an easy task to try and find the source of this sudden surge in space knowledge and interest, but by asking around, the culprit seems to be the sudden popularization of the crowd funded Mars One initiative. This campaign hopes to have permanent human establishments on Mars by 2024, and has already had thousands of applicants willing to take the one-way trip to Mars. It may be that the sense of curiosity and exploration has come to a level the general public can relate to, rather than staying within the field and known only by the professionals working in it. Partying at the "Opportunity Rover Not Quite Dead Yet Bash" on January 25th. At right are Sarah Ansari-Manea and Leeav Julius Lipton. Photo c/o author. 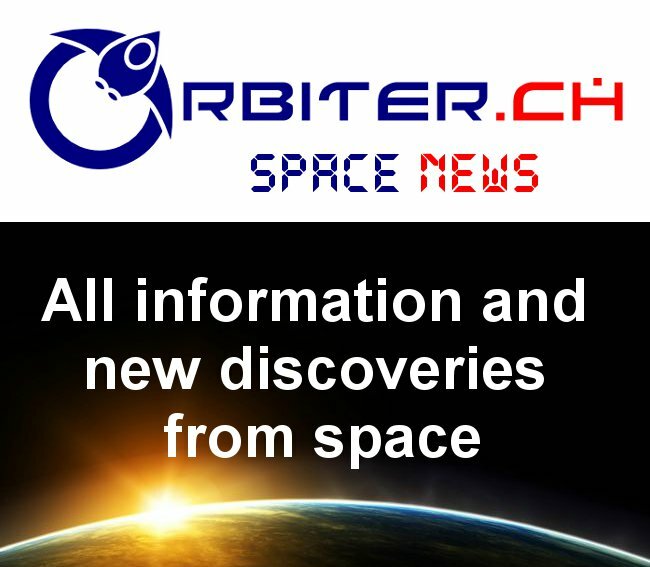 It may also be due to the more frequent news regarding commercial space flight and the growing perception that space travel is no longer only for highly trained astronaut and pilots. Whatever the reason, Toronto is becoming more and more excited about space and the vast unknown, which will bring new social and intellectual gatherings to look forward to. Cosmonauts Kotov & Ryazanksy. Photo c/o NASA. According to the January 27th, 2014 Canadian Press article "Cosmonauts install Canadian company's cameras on space station," two high definition cameras built by Vancouver-based UrtheCast Corp to transmit Earth images from the International Space Station (ISS) are now online after a Jan 27th spacewalk by two Russian cosmonauts. But there might still be hurdles for the plucky BC start-up to overcome. According to the January 27th, 2014 CBS News article, "Camera problem persists after spacewalk setup," a "problem of some sort" is still preventing images from a second, lower-resolution camera from sending telemetry to the ground. The company is expected to make an official announcement later today. UrtheCast developed the two cameras to provide high resolution still images as well as the world's first ultra HD (aka ‘4K’) video feed of Earth. The images and video will be made available to the public via Urthecast’s web portal as a mixture of free and paid content. The ultra HD video and still imagery of Earth expected to be captured by UrtheCast's cameras will enable a variety of applications such as environmental monitoring, humanitarian relief coordination, organizing social events, land usage analysis and many others. The company will also provide developers with an open source application programming interface (API) so they can develop apps and games that utilize the cameras’ data. UrtheCast is one of several firms currently looking to provide real-time, "better than Google Earth imagery" according to the January 7th, 2014 Atlantic article "Silicon Valley's New Spy Satellites," which singled out Urthecast, Planet Labs, and Skybox as the start-ups most likely to build a revenue generating business. 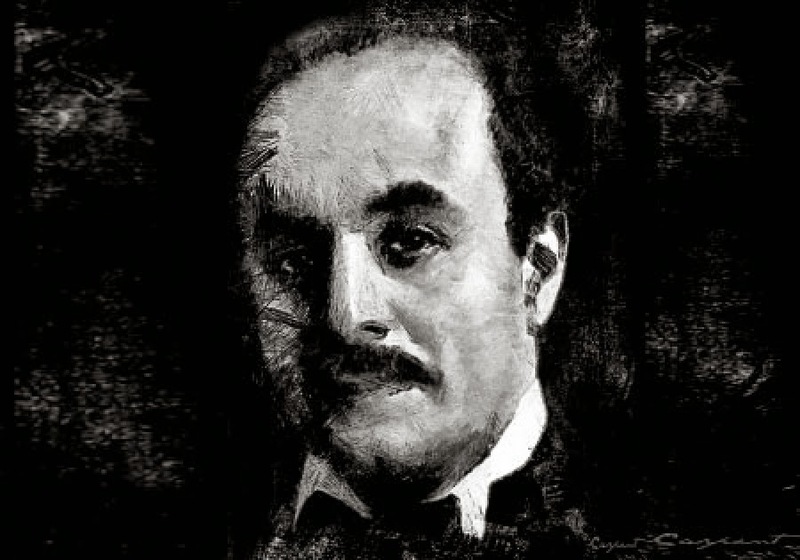 “Space is not space between the earth and the sun to one who looks down from the windows of the Milky Way,” according to author Khalil Gibran, in his poem "Sand and Foam." UrtheCast began in 2010 with five employees, growing to 65 in both Canada and the US. After an initial investment of $500,000 CDN, the company went on to raise over $77 million in funding after going public via a reverse takeover of publicly-traded Longford Energy Inc.
As development of the cameras progressed, Urthecast approached the Russian Federal Space Agency (Roscosmos) and pitched the idea of mounting the cameras to the Russian portion of the ISS. Roscosmos embraced the idea and lent its full support. In a deal struck between Urthecast and Roscosmos, Roscosmos will hold the rights to Urthecast data in Russia, while Urthecast holding rights for all other nations. The success of today’s spacewalk is no doubt welcome news after an attempted installation in December met with setbacks. As outlined in the January 27th, 2014 Associated Press article, "Russian cosmonauts undertake spacewalk to hookup Canadian-made camera," cosmonauts Oleg Kotov and Sergey Ryazanskiy had connected the cameras to the ISS during a post-Christmas spacewalk. But Urthecast ground stations received no data from the cameras, forcing the cosmonauts to bring them back inside. The issue was eventually traced to indoor ISS data cabling and resolved, paving the way for today’s successful install. UrtheCast will spend the next month calibrating and testing the two cameras. Urthecast CEO Wade Larson said he expects to release the first picture in five weeks, with full video streaming beginning in mid-summer. Soon, a crystal-clear view of the Earth from above can be had by anyone with a simple click of a mouse. Canadian Space Industry Shrinks While International Markets Grow! A report released Tuesday through the Canadian Space Agency (CSA), strongly suggests that Canada can no longer "punch above its weight" in the fast growing, international commercial space marketplace. According to the 2012 State of the Canadian Space Sector Report, the 140 companies and organizations listed in the Canadian Space Directory generated $3.327Bln CDN in revenue in 2012, down from $3.483Bln in 2011. Overall, Canadian domestic revenues decreased by 4.1% and Canadian space industry exports decreased by 4.9% during the period covered by the report. But another report, released eight months earlier by a US based advocacy group called the Space Foundation, concluded that there was an overall 6.5% increase in international space focused products and services revenue for 2012, and a larger 11% increase in revenues generated from commercial infrastructure and support industries during the same period. In essence, while the overall international markets for space focused products were growing in 2012, the Canadian share of those revenues was shrinking, both as a percentage of the overall market and in absolute terms. As outlined in the April 9th, 2013 post "Global Space Economy Now $304B Annually: 2013 Space Report," the 2013 Space Report, an annual publication from the Space Foundation, a US based advocacy and research group, reported that, "the global space economy grew to $304.31 billion in commercial revenue and government budgets in 2012, reflecting growth of 6.7 percent from the 2011 total of $285.33 billion. Commercial activity, space products and services and commercial infrastructure, drove much of this increase." It's well known that Canadian companies, focused on robotics, imaging, science experiments and telecommunications technologies, typically possess no spaceports or "commercial" infrastructure of their own. Perhaps that could account for the differences between the domestic Canadian market in 2012 and the demonstrated international opportunities. Maybe we're just poorly positioned to take advantage of these new areas of growth. Or maybe not. After all, this isn't the first time that Canadian capabilities in this area have been questioned. As outlined in the September 11th, 2011 post "Canadian Space Competitiveness Falls Behind India Reports International Study," the 2011 Futron Space Competitiveness Index, a yearly ranking of the underlying government, human capital and industry drivers of aerospace competitiveness, dropped its estimate of Canadian competitiveness from sixth to seventh behind India. The index cited government delays with the development of policy related to what was then called a "long-term space plan" (it's now called a "10 year plan," but still hasn't been released), plus an erosion of Canadian robotics expertise as the drivers for its decision. The index further stated that Canada was also losing ground to other big space and aerospace players and was being challenged hard by Brazil, China, Israel, Japan and South Korea. But on the upside, the new CSA report did include a forward from CSA president Walt Natynczyk and at least one positive component. The space industry has recovered almost 500 full time jobs since 2011, for a total of 7993, after losing 792 positions in the 2010 report. What would Chris Hadfield say about that! According to the January 3rd, 2014 CBC news post by Quirks and Quarks host Bob McDonald titled "Space will be a hive of activity in 2014," the next year will see many advances as "new robots reach Mars, another robot touches a comet, a new capsule to transport humans makes its first flight and private enterprise continues to lead the way in leaving the planet." Of course, most government activity will remain Earthbound as Federal politicians dither interminably over policy, funding and goals (such as outlined in the January 13th, 2014 blog post "Just Announced: Yet Another Science and Technology Policy Review!") and Canadian Space Agency (CSA) president Walter Natynczyk (perhaps the most publicly shy CSA president ever) continues to carry on towards the release (maybe) of the "10-year plan" described in the November 14th, 2013 Canadian Press article "Canadian Space Agency chief points to 10-year plan." Even the annual State of the Canadian Space Sector report, an economic analysis outlining Canadian space industry activity normally released during the November/ December period has not yet surfaced. 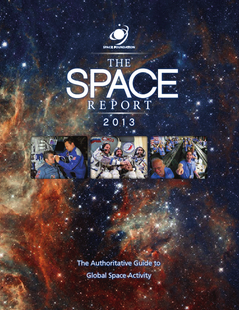 The last report, covering 2011, was released on December 3rd, 2012 with a forward from then CSA president Steve MacLean, and much has happened since (Note: The 2012 State of the Canadian Space Sector report, with a new introduction by the current CSA president was finally posted on the CSA website on January 21st, 2014. The new report, indicated that overall space sector revenues decreased nearly 4.5% between 2011 and 2012 although the total number of sector jobs increased). So its fortunate that Canada's real space future is going to be discussed and assessed in both the quiet backrooms and on the raucous public stages of a series of well attended international events and national conferences over the next sixteen months. 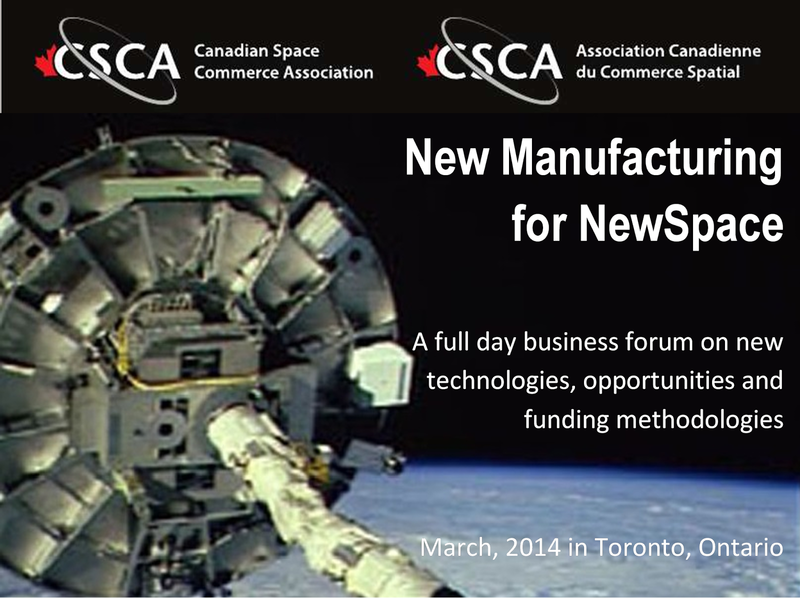 First up is the 2014 National Conference of the Canadian Space Commerce Association (CSCA), focused on the business, political and funding issues surrounding “New Manufacturing for NewSpace,” which will be held in Toronto, Ontario on March 13th. The conference will focus on new manufacturing techniques developed using computer-aided design methodologies, solid free form fabrication (including 3D printing), selective laser sintering and other fast developing technologies which promise not just to revolutionize Earth based manufacturing, but space exploration as well. The conference hopes to ask the highly commercial question, "what can space companies learn from domestic manufacturers today?" In the interests of disclosure, its also worth noting that the author of this article is also helping to organize the CSCA conference. 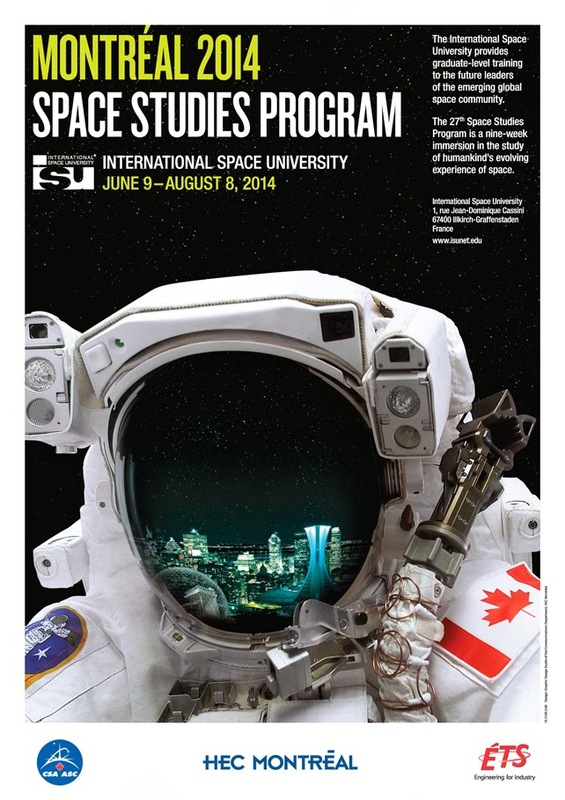 Second up is the 2014 Summer Space Studies Program (SSP) of the International Space University (ISU), which will be held in Montreal, PQ from June 9th - August 8th. This not-for-profit interdisciplinary university was founded in 1987 by Peter Diamandis, Todd Hawley and Robert D. Richards to provide graduate-level training to the future leaders of the emerging global space community from its central campus in Strasbourg, France and at various summer locations throughout the world. ISU has graduated more than 3700 students from over 100 countries and built them into the nearest thing to a "space mafia," a network of professionals and leaders which facilitate both individual careers and "international space cooperation." However, although the CSA is currently listed as one of three Canadian sponsors for the 2014 summer session (along with HEC Montréal and École de Technologie Supérieure) the June 18th, 2012 blog post "Canadian Space Agency "Pulling Financial Support" for International Space University," reported that CSA future funding would be curtailed and CSA representatives could no longer participate on the ISU Board of Directors because of Federal budget cutbacks. Given that, it will certainly be interesting to see what the Summer 2014 organizers, professors and students leave behind in the minds of their Canadian counterparts after classes finish up. With industry focused on business and academics focused on space studies, the international legal community will be queuing up for the 2nd Manfred Lachs International Conference on Global Space Governance, which will be held in Montreal, PQ from May 29th - 31st. 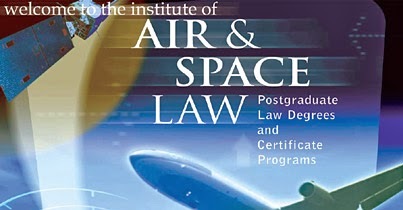 The conference, organized by the world renown McGill University Centre for Research in Air and Space Law, will focus on issues not formally addressed since the 3rd United Nations Conference on the Exploration and Peaceful Uses of Outer Space (UNISPACE III) and related to the further development of a legal infrastructure governing space activities. These include security and space issues, the role of the private sector in global space governance, telecommunications issues (such as the equitable sharing of radio frequencies and orbital positions), human space flight, aerospace transportation issues, space based natural resources, and space-based solar power. Say what you want about lawyers, but the development of a consistent and practical infrastructure governing interactions is the key to both the development of commercial opportunities and the continued exploration of the high frontier. Fall space activities are normally dominated by the annual International Astronautical Congress. The 65th International Astronautical Congress (IAC2014) will be held in Toronto, Ontario from September 29th - October 3rd. This years event, organized by the International Astronautical Federation (IAF) and hosted by the Canadian Aeronautics and Space Institute (CASI) is focused around the theme of how "the world needs space." IAC2014 will likely overwhelm other Canadian space and science focused events during that period, if only because the event includes a scheduled meeting between the heads of the major government space agencies. The 65th IAC was previously discussed in the November 10th, 2013 blog post on "The 65th International Astronautical Congress: September 29th - October 3rd, 2014 in Toronto." And finally, the 2015 International Space Development Conference (ISDC2015), the annual conference of the US based National Space Society (NSS), will be held in Toronto, Ontario from May 20th - 25th, 2015. Locally organized by the same CSCA which is also organizing the "New Manufacturing for NewSpace Conference" in March 2014, this later event is expected to focus on commercial activities and tie together lessons learned from the earlier events. Its also the first time the NSS has held an ISDC outside of the continental US since 1994. All things considered, it sounds like the Canadian space industry should stand by for adventure. Let's hope that the Harper government can keep up with the legal sector, the academic sector and the private sector as our next great space age continues to unfold. As the NewSpace industry matures, so do the opportunities for greater diversification and stability, as events in the past few weeks have shown. On January 8th, Louisville, Kentucky based Sierra Nevada Corporation (SNC) announced a new partnership with the European Space Agency (ESA) and the German Aerospace Center (DLR) to support development of the company’s Dream Chaser spaceplane. 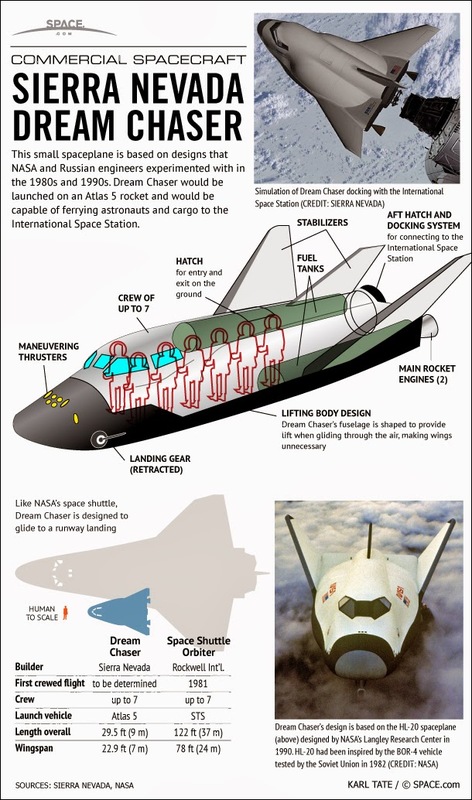 SNC is developing the Dream Chaser to ferry cargo to and from the International Space Station (ISS) as part of NASA's Commercial Crew Development (CCDev) program. Though SNC is still competing for the final CCDev contract, Wednesday's announcement sends a clear message that the company is diversifying its customer base and so will be less reliant on US government funding. This diversity will become increasingly important in the face of the US budget battles likely to come. The January 9th, 2014 Denver Post article "Dream Chaser program partners with European space agencies" quoted Mark Sirangelo, the corporate vice president of SNC as stating that, "there is a basket of significant technologies" that the ESA and the DLR can offer to the Dream Chaser program. For example, The ESA offers expertise in re-entry systems, while the DLR offers lightweight materials that can be used on the Dream Chaser. In addition, the DLR has conducted air-traffic-control research for integrating spaceplanes into commercial airspace. In essence, the Europeans also gain access to a new suborbital spacecraft considerably less expensive than traditional launch vehicles while SNC expects to obtain access to an untapped market as well as valuable technology and research. Of course, deals of this type can also travel in the opposite direction. On January 13th, UK-based Reaction Engines Ltd. announced that it had signed an agreement with the US Air Force Research Laboratory (AFRL) to cooperate on development of the company’s Synergistic Air-Breathing Rocket Engine (SABRE). The US government will gain access to the revolutionary SABRE engine for use in hypersonic vehicles, while Reaction Engines gains access to US research facilities and funding. The company’s increased resources will allow it to push forward with development of its Skylon orbital spaceplane, which will be powered by the SABRE engine. Like SNC, Reaction Engines has diversified into a new market, but also into a new market segment (the Military). The recent SNC and Reaction Engines deals mark a significant milestone in the growth of the Newspace industry. By acquiring new partners, diversifying resources and entering new markets, these firms have attained a greater stability. It is this stability that will both spur growth and help to weather misfortune. Space tether. Graphic c/o Wikipedia. Japan has begun trials utilizing a new method of space cleanup to begin to deal with the large amounts of space debris accumulated around the planet since the start of the space race. 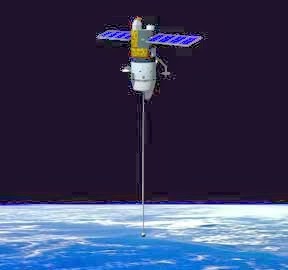 As outlined in the January 15th, 2014 Yahoo News article "Japan scientists test tether to clear up space junk," the new technique will utilize an electrodynamic space tether made from thin wires of stainless steel and aluminium, which will attract dead satellites and other debris magnetically. The electricity generated by the tether as it swings through the Earth's magnetic field will also have a slowing effect on the space junk, which will cause the orbit to decay and the space junk to eventually burn up in the Earths atmosphere. The tether, designed and built by a team of researchers at Kagawa University for the Japan Aerospace Exploration Agency (JAXA) using techniques derived from Japanese fishing equipment manufacturing firm Nitto Seimo, is expected to be launched into orbit aboard a Japanese rocket in February 2014. "The experiment is specifically designed to contribute to developing a space debris cleaning method," according to Masahiro Nohmi, an associate professor at Kagawa University. Of course, Japan isn't the only country aware of both the dangers of orbital debris and the potential of tethers. As outlined in the January 16th, 2014 Bloomberg article "Cleaning up the Final Frontier," at least one other commercial NewSpace company, Tethers Unlimited, has come to much the same conclusion. Others have also looked into the problem, as outlined in the October 3rd, 2013 Popular Science article "5 High-Tech Space-Junk Solutions." But the current interest isn't just academic. It's driven by an exponential increase in the number of unnecessary artificial objects soaring around since the dawn of the space age. In 2009 NASA estimated that there were approximately 19,000 pieces of non-functioning, man-made and track-able pieces of “junk” currently in orbit and many more smaller objects with the potential to damage or destroy, according to the April 2009 NASA media briefing on "The Threat of Orbital Debris and Protecting NASA Space Assets from Satellite Collisions." The report also indicated that potential collision warnings between space debris, operational and inactive satellites, manned spacecraft and even the International Space Station (ISS) are issued regularly, particularly in low Earth orbit and at the poles where orbits are more likely to overlap. Even so, there have been at least four major collisions in the last few years according to the April 27th, 2013 EarthSky article "Space junk headed for a cascade of collisions." NASA and other international space organizations have developed a specific set of guidelines to determine whether maneuvering is necessary to avoid collisions, and have agreed to follow UN guidelines in a preventative attempt to minimize space clutter. But even with the collisions and frequent scares, engineers and scientists are slow to react to the orbital junk issue, and those leading the charge have little support. It is proving to be hard to justify the billions of dollars that would be expended on a cleanup project of this magnitude. “The really hard part is trying to convince other countries that your garbage truck in space will be used for the peaceful purposes stated—and not to mess with other people’s satellites,” says Dave Baiocchi, an engineering professor at the Pardee RAND Graduate School. If space travel and exploration is to continue, cleanup, or at least a stricter international set of guidelines in space waste management, must be considered. At the current rate of orbital debris accumulation, space travel will be incredibly difficult and dangerous in the future. Just Announced: Yet Another Science and Technology Policy Review! Greg Rickford. Photo c/o FedNor. 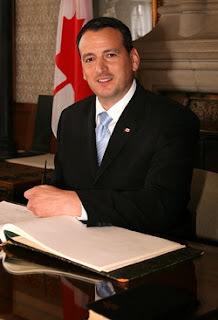 Greg Rickford, the Minister of State for Science and Technology (S&T), has announced the launch of yet another Federal government consultation to "seek input from Canadians on a new federal Science, Technology and Innovation Strategy." But this new report, which comes on the heels of the Federal Review of Aerospace and Space Programs and Policies (or "Emerson Report," which was presented to the then Industry Minister Christian Paradis in November 2012) and the Review of Federal Support to Research and Development (or "Jenkins Panel," which was presented to then Minister of State Gary Goodyear in October 2011), is unlikely to recommend anything substantially different from its predecessors. As outlined in the January 8th, 2014 Industry Canada (IC) press release "Government Seeks the Public's Input on Science, Technology and Innovation Strategy Renewal," this latest consultation will seek to update the 2007 Mobilizing Science and Technology to Canada’s Advantage report which defines the functions and responsibilities of the Canadian Space Agency (CSA), the National Research Council (NRC) and various other government departments focused on science and administered through IC. The 2007 document advocated focusing government R&D activities around the commercialization of technologies, rather than basic research. Even better, as outlined in the May 22nd, 2010 blog post "The "Three Kings" of Canadian Commercial Space," the current policy is simply the latest iteration of a longstanding and widely supported policy to encourage research commercialization as the cornerstone of the Canadian science and technology strategy. It's also worth noting that both the Emerson report and the Jenkins panel were essentially in congruence with the existing policy. 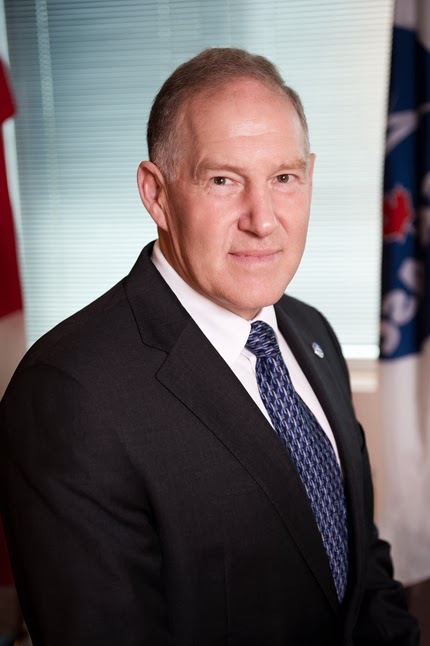 Even so, Rickford has come under much recent criticism regarding it. 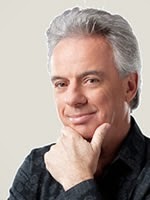 For example, as outlined in the January 13th, 2014 News1130 post, "Ottawa’s Minister of State for Science downplays criticism," the Minister has publicly rejected the findings of a survey conducted by the Professional Institute of the Public Service of Canada, which found that "34 per cent of over 4000 federal scientists asked feel they’re being prevented from talking to media or the public about their work. (As well,) 24 per cent said (that they) have been asked by the government to alter their findings for non-scientific reasons." According to the press release, interested parties will have until February 7th, 2014 to submit a written report. Just don't expect any major policy changes to come from this initiative. 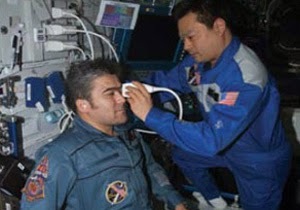 Ultrasound exam on ISS. Photo c/o Mediphan. Ottawa based Mediphan, known for making remote medicine possible aboard the International Space Station (ISS), has been developing and perfecting their technologies. Remote-access medicine, also known as telemedicine, is a growing field whereby patient information is transferred through a series of standard networks, allowing for a doctor to remotely diagnose, and occasionally conduct procedures. The technology has immediate applications during long duration space missions, such as potential travel to mars and beyond, as well as use here on Earth in areas that require remote medical access. But as outlined in the April 13th, 2013 blog post "Canadian based Mediphan Inducted into Space Technology Hall of Fame," the company is essentially unrecognized at home, although it is recognized internationally. As outlined on the Space Foundation website, “Mediphan technologies enable the cost-effective application of telemedicine solutions, created by Dr. Dulchavsky’s team and NASA for spaceflight, to better life on Earth, especially in developing countries around the world.” In April 2013, the Space Foundation inducted Mediphan and the NASA Johnson Space Center, along with Dr. Scott A. Dulchavsky, Mediphan CEO Mike Sandler and NASA astronaut Dr. Leroy Chiao for their role in developing and commercializing the Mediphan technology. Interestingly enough, Mediphan CEO Sandler is also the founder and CEO of Epiphan Systems. The company, (which owns Mediphan) made its name providing remote business collaboration solutions using a product line of frame grabbers, recorders and broadcasting devices enable personnel located in various locations to interface in real-time, collaborating and exchanging ideas via voice, video and data. As outlined in the May 21st, 2013 press release, "Epiphan to demonstrate the latest AV Capture, Streaming, and Recording Appliances at Infocomm 2013 on June 12-14 in Orlando, Florida" and the July 4th, 2013 press release, "New firmware adds Set-Top Box and Smart TV functionality to VGADVI Broadcaster, Lecture Recorder x2, VGADVI Recorder," Epiphan recently announced additional capabilities for its product lines to allow it to add direct consumers to its solutions, by incorporating set top boxes and smart TV capabilities. These additional capabilities mean that Epiphan/ Mediphan can add revenue from companies looking at expanding their environmentally friendly telecommuting environment or other organizations. Workers at home or any Internet connected location, can be communicating in real time with coworkers or other personnel, without the need for specialized equipment. Students can receive course content delivery in real-time from a live class taking place thousands of kilometers away, just by having access to an Internet connected TV. While Epiphan focuses on delivering collaborative solutions for use here on earth, Mediphan enables collaborative solutions for space travel beyond Earth’s safe environment. Hot Three-way Global Satellite Action! German military theorist Carl Von Clausewitz once said that “War is the continuation of politics by other means.” Recent moves in the global satellite navigation market by the US, Russia and China suggest that space is the continuation of trade wars by other means. On Dec 26th 2013, US President Barack Obama signed a defense budget bill into law effectively banning Russia from building ground stations for its GLObalnaya NAvigatsionnaya Sputnikovaya Sistema (GLONASS) satellite navigation system on US soil. The Republican-backed bill requires the Secretary of Defense and Director of National Intelligence to provide proof to the US Congress that the monitoring stations would not be used to spy on the US, or pose any threat to US national security. The law does include provisions for the US Congress to waive the need for proof, though political pundits consider such a waiver unlikely. In 2012, the Russian Federal Space Agency (Roscosmos) first pitched the idea of building six GLONASS antenna arrays and monitoring stations in the US to the US State Department. The structures would help improve GLONASS’ accuracy and reliability vis-à-vis the US’ own Global Positioning System (GPS). GLONASS is being marketed as a global alternative to GPS, in addition to serving Russia’s military and civilian markets. According to the December 23rd, 2013 New York Times article "New Law All but Bars Russian GPS Sites in US," the US State Department had supported the building of the stations as a way to ease rocky relations between the US and Russia brought about by disagreements over such issues as Edward Snowden and the Syrian civil war. However, US Republicans, suspicious of Russia’s motives, moved to sink the initiative. The Pentagon and the Central Intelligence Agency (CIA), supposedly concerned over Russian spying within US borders, sided with the Republicans. There are no restrictions on GPS signal reception or use in Russia or anywhere in the world. We have always been open to cooperation. All specialists have always said and continue saying that customers will benefit much more by using both systems - the GLONASS-GPS combination - than by using just one. Russia had hoped to boost GLONASS’ competitive advantage by using it in tandem with GPS to boost accuracy, especially on mobile devices (i.e. smartphones and tablets). As outlined by the December 29th, 2013 Technoblimp article "Russia's GLONASS Essentially Banned from the US by New Law," many mobile device manufacturers (including Apple, Sony, and HTC) already use GLONASS compatible chipsets on their devices since Russian law requires them to. As outlined on their corporate website under the headline "GPS and GLONASS: “Dual-core" Location For Your Phone," Qualcomm Corporation, a US based provider of digital wireless telecommunications products and services, conducted tests in 2011 that showed using GLONASS and GPS signals together boosted location accuracy to 2 meters. Enter the Dark Horse: China. On Dec 27th 2013, the China Satellite Navigation Office announced that China will provide free global access to its Beidou satellite navigation system by 2020. The Beidou system currently consists of 16 satellites, but starting in 2014, China will begin deploying new satellites with upgraded capabilities. Plans call for Beidou to be expanded to a constellation of 40 satellites by 2020, providing global coverage and improving positional accuracy from the current 10 meters to 2.5 meters. Chinese smartphone manufacturers are now incorporating Beidou chipsets into their products, which will arrive on retail shelves this year. China also announced its first foreign Beidou customer, Thailand. As outlined in the December 27th, 2013 CCTV.com article, "Thailand to become first overseas user of Beidou," Thailand’s Space Technology Development Agency is currently building a Beidou ground station near Bangkok. Thailand plans to use the Beidou system for disaster response. In essence, after decades of US dominance, alternatives to the US based GPS are now coming to the forefront. In the coming decades, competition will intensify from Russia’s GLONASS and China’s Beidou as well as in-development systems like the European Union’s Galileo global navigation satellite system and India’s Indian Regional Navigational Satellite System (IRNSS). The United States’ obstruction of GLONASS ground stations could be seen as a protectionist move aimed at stymying foreign competition; a preview perhaps of things to come. The increasing role of space as an area of commerce could serve to bring nations together or provide the basis for future conflict (as with the Opium Wars of the 19th century). The coming decades will show which path the world chooses.